Daredevil Redemption, written by David Hine with art by Michael Gaydos, was published as a six-issue mini series in 2005. The story touches on things from what was then current continuity with the end, set seven years after the main story, taking place in the aftermath of Matt being outed as Daredevil by the press. For the most part, however, this is a stand alone story that can be enjoyed years later even by people who may not be too familiar with the Daredevil mythos. Inspired by a real story (see the background on the the so-called West Memphis Three), Daredevil Redemption sees Matt the lawyer take on a case far away from home, and is uniquely focused on the civilian and professional aspect of the character. While Daredevil does appear in costume throughout the story, the inclusion of Matt’s costumed alter ego could have easily been scrapped altogether – I would argue that it perhaps should have been – and the format allows the writer to tell a story that is far removed from what you would expect from a superhero book. The story begins with Matt, as Daredevil, having a bad night in Hell’s Kitchen when he misinterprets a violent scene between a father and his teenage son as being more sinister than it really is. This introduces a couple of the themes of the story, that is the “shady gray areas” of the law, and the difficulty in seeing things for what they are and ignoring ones prejudices and assumptions. 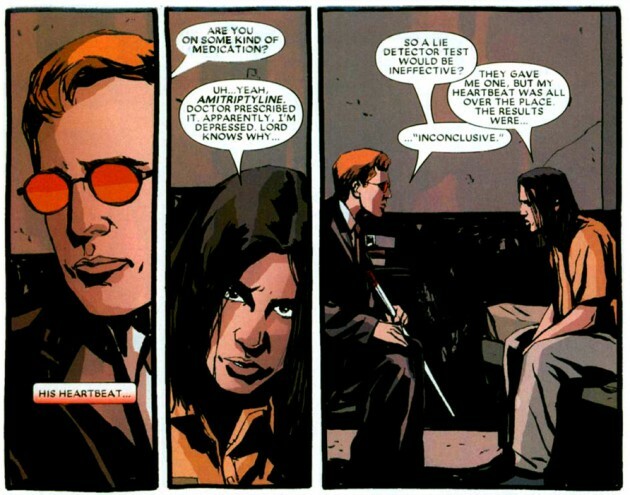 Hine stays on this topic by cutting to a conversation between Matt and Nelson & Murdock intern Candace MacDermid, a character created for this story who continues to serve as a major supporting character throughout the mini-series. They are interrupted by a certain Emily Flood who has come to Matt with a very special request. Emily presents her case to Matt, Foggy and Candace. Her son Joel, his girlfriend and the girlfriend’s brother stand accused for the murder of a young boy, a crime Emily is convinced that her son did not commit. Instead, Emily suggests that the three teenagers have been targeted because of the way they dress and the kind of music they listen to. Their entire home town of Redemption, Alabama believe them to be satanists and that the murder was part of a satanic ritual. Matt is quickly persuaded by Emily’s plea and he and Candace set off for Alabama. Matt is only actually licensed to practice law in his home state, but this detail, as well as the many others that relate to various legal matters, is handled as it would be in real life and it’s obvious that Hine spent a lot of time doing research for this mini-series. The whole story feels very believable, and if it weren’t for the small detail of having a blind guy running around at night in red longjohns, the story would be a typical, though unusually compelling, legal drama. What isn’t typical though, is having a lawyer working a case who’s got something of an edge when it comes to determining whether people are lying or not. While Matt’s “truth sense” is an important part of how he operates as a character, it can potentially be a hindrance for the writer. Hine handles this by having Matt’s client present with an unusual physiology which makes it impossible for Matt to determine whether or not he’s lying. This is a case he has to handle using only his skills as a lawyer and investigator and his intuition. It’s a clever twist. As the story progresses, there are hints of many factors at play. There is talk of “bad blood” in the Flood family, and signs of foul play and obvious prejudice on behalf of both the townspeople and the local authorities. The pacing of Daredevil Redemption is nearly flawless and the layers of the story are methodically pulled back. It’s also a story that makes you think and manages to surprise the reader to the very end (which I will not reveal here). My one main complaint with this book is that Marvel couldn’t go all the way and have this be a straight Matt Murdock story. Having Matt bring along his alter ego only makes sense from the perspective of selling the book to people who must see Daredevil in costume at all cost even though, ironically, the subject of the story probably wouldn’t appeal to these readers anyway. If Matt must sneak around at night, it would make more sense for him to find another form of disguise. As mentioned, the majority of the book takes place in the past, before Matt had any real issues with his secret identity, but it still feels like an ill-advised move. The art is by Michael Gaydos whose style features broad lines, lots of shadows and a certain blockiness. I quite like it, but wish Matt’s glasses didn’t look like pieces of red paper (not to mention the same from every angle), but that’s a minor – if slightly distracting – complaint. Daredevil Redemption is a solid read and I particularly recommend it for people who enjoy the lawyer aspect of Daredevil. In fact, I think there are elements here that could inspire writers of the main series to at least consider letting Matt the lawyer get his Law & Order on every once in a while. I just came across this trade at WonderCon! I could have bought it for half price, but I had never heard of it and didn’t know whether it was any good. And now I see that it is. Guess I’ll look out for it. Thanks for the timely review! Yeah, I quite like this mini, and I think it’s worth picking up. 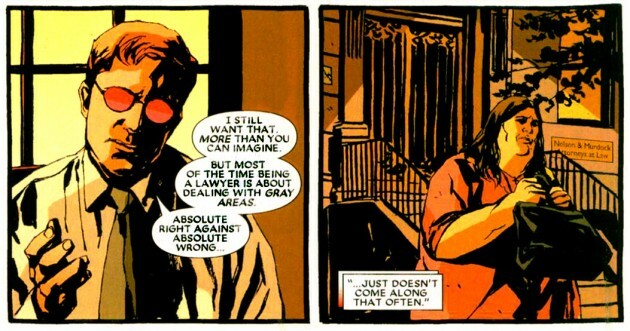 It’s a different but very in-character take on Matt Murdock and it’s more of a detective story than what we usually see. I think there are quite a few copies floating around out there in comic book stores so you should be able to find one cheap. I’ve been reading your blog for a while and I like your approach to DD. I agree with your complaint: Redemption would have been a really good story even without Daredevil, but maybe we are a little overwhelmed from the alter ego in the regular issues! I don’t know if I’m an outsider in the DD’ fans world, but I love Matt’s work, so I’ve really been involved in Redemption. Cool review, Christine. Although almost all the reactions I’ve seen to this mini series are favorable, including this one, obviously, I’m very apprehensible about an out of continiuty story. For me, such stories seldom manage to do much save for leaving the aftertaste of being something inconsequential and meaningless. However, having never experienced this series before, and since it’s artistry by one Mr. Gaydos, whose art in a recent ASM issue I liked very much, I just may give the first couple issues a try during another DD skip month. Couldn’t hurt, right? For those who haven’t finished Daredevil Redemption, my post below is laden with spoilers. Tread carefully, folks. Tell me, was anyone else not absolutely upset at the ending of this series? How could Matt have done nothing! How could he have just sat there and watch the innocent kid die KNOWING he was innocent? How could have heard those please for help and, with his powers and abilities as DD, do NOTHING? My goodness, what a terribly sad story. It was competently done all around, but this isn’t one I can say I’d recommend. I truly hate that Matt didn’t try to do anything after learning this wrongly accused and newly made father was going to an early death he didn’t deserve? After the scene wherein Matt does nothing but sit idely by and, with his sences, “watch” this kid slowly die, all I could think to myself is how could Matt let this happen? Isn’t he a hero? Aren’t people like this kid why he does what he does as Daredevil? How the hell could have just sat there do NOTHING? The scene in question was just awful and heart-wrentching to see. Matt should have something. SOMETHING. How could he live with himself after that? This was a very disappointing and sad end. Hey Dre, i met the author David Hines and he signed my copy of Daredevil redemption. I had the same complaints as you did about Matt doing nothing, I argued that he’d not let an injustice be done like that on someone clearly innocent. Hine argued that he wanted to show that Matt wanted to let the Law’s decision be upheld even if he knows the Law was not right.